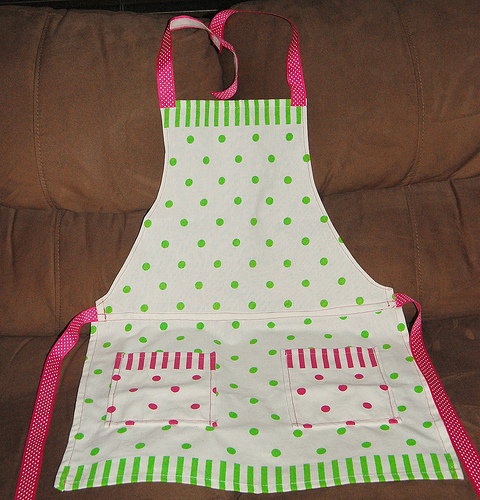 A Spring-y, fun and flirty apron. Your call as to where you use it: kitchen, craft room, ect. It’s got an adjustable, Velcro neck tie and two pockets. 1) You will need three placemats, two identical and one coordinating. I found mine at the Dollar Store. Yeah, for real. One suggestion, before you buy the placemats, check that they are the same width. It’ll make things easier later on. 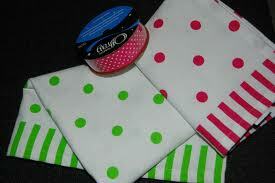 You will also want coordinating ribbon, Velcro and thread. 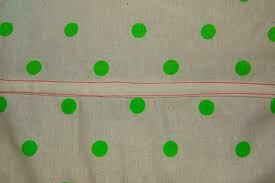 2) Begin by sewing the two identical placemats together width-wise. You will want to put the top one overlapping the bottom one. Sew the edges of both placemats down, so there will be two seams. 3) Next, measure out your ribbon for side ties. I made mine about 15 inches long for each side. Sew those on where the placemats over lap. I sewed mine in-between the two placemats, but if your mats are the same size, you won’t have the extra hanging fabric I would have. That’s why I did it in-between. 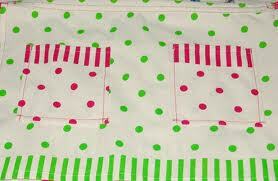 4) Fold the apron in half and cut the top placemat to create the arm holes and neckline. I left my neckline straight. I folded the slanted arm holes back, stitched it down and then applied Fray Check to the seam. 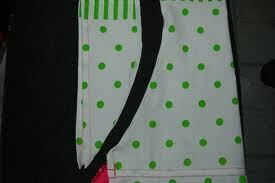 Or you can sew the seam under. I didn’t like the way it made my top placemat lie when I had it on though. 5) Measure out your ribbon for your neck ties. If you choose to make it adjustable, one side should be about 1.5 times as long as the other side. Sew the ribbon to the top of your apron. Pin it on and try it on to see how it sits while you’re wearing it. Make sure it’s in the right position before you sew. 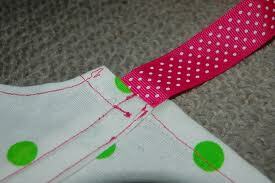 6) Pin your Velcro on and sew it to the ribbon. If you want it to be adjustable, make one side long and the other side just enough to securely attach. 7) Ok, time for your pockets. Take your coordinating placemat. Decide how big you want your pockets and how many. Cut them out. Hem the edges. Place the wrong side of the pocket on the right side of the apron in the arrange you desire. Sew on. TA-DA! You’ve done it! Fairly easy, right? Only seven steps and total cost of this project: less than $5. Out of pocket is a little more, but I still have ribbon, Velcro, thread and a little bit of my third placemat to use on other projects. Not too shabby. MANDATORY ENTRY: Follow While He Was Napping blog with GFC. Just hit the follow button on the right sidebar. 1) Like WHWN on Facebook. 2) Check out my Etsy and leave me a comment on your favorite item. 3) Link up a recipe to the Recipe Exchange AND place the button on your blog. Please include your link number at the party (hover over your image and the number will show up) and the link to your blog where you have placed the button in your comment. If I can’t find both, this entry doesn’t count. That’s a total of 5 possible entries per person. Please leave a SEPARATE COMMENT FOR EACH ENTRY! Giveaway ends March 25 at 11:59pm PDT. Winner will be chosen via random.org and announced here on March 26. If you win, you must contact me within 48 hours or a new winner will be chosen. I will email you if you leave an email address… I won’t go hunting for one though. I will verify the mandatory entry, as well as the winning entry method. Again, PLEASE LEAVE A SEPARATE COMMENT FOR EACH ENTRY (or you won’t get the right amount of entires!). Good Luck! That is SO cute! My son has an apron and he LOVES it! He wants to wear it all the time! Thanks for sharing over at Tuesday Tell All. Super cute! Never would’ve thought of using placemats from the dollar store! That is SUPER cute! Please enter me in the drawing! SO cute! Love it!I would love it if you added this to my new link party! This is so adorable! I am a follower! My favorite season is spring, because that is when the flowers start blooming! love it! From your ETSY store I Love the “Families are Forever” vinyl. Follower of While He was Napping! this is way cute. You are so talented. love your bathroom subway art! I follow your darling blog! Really…what a fun bunch we have here…I love the Spring Fling givaways..WE really need to win the flirty lil apron! AdOrAbLe blog home here…stop over and meet us soon! And now we follow you too! Ok..so we just came over from Anna’s! And we love it here! I went to your Etsy and I really like your handcrafted earrings. Cute! I love the Kitchen Themed Subway Art. I’ve been following you for awhile. Thanks for the chance to win. The ocean breeze jewelry set is Fabulous! I love the I Spy Bag Pencil Case for my son – he would love it! I am an Ask Anna follower as well! I am a While He Was Sleeping follower. I LIKEd you on Facebook too! Hope you will come visit and do the same! Im also a participant and wanted to come over and become a follower! I follow you and would love this cute apron! I like the Ocean Breeze Jewelry set! Beautiful! I like WHWN on Facebook! I am now following WHWN blog VIA GFC! Just found your blog and now I am following! I am a new follower! Very nice blog! I really love the Home Choose Your Own Adventure Date Night – On the Town Edition. I LOVED those books as a kid. Love the way you changed it up for adults. I’m a new follower of Ask Anna! I love your peel and stick flowers! Cute! I thought I already liked you on Facebook, but I didn’t! I am now though!